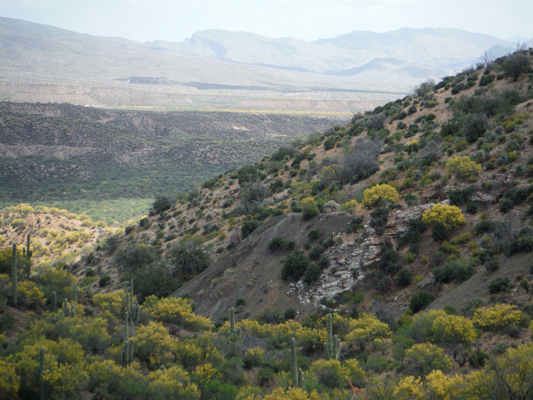 Both the Cowboy Mine and the Vanadium Mine are located on the south side of the Dripping Springs Valley in Gila County in central Arizona. 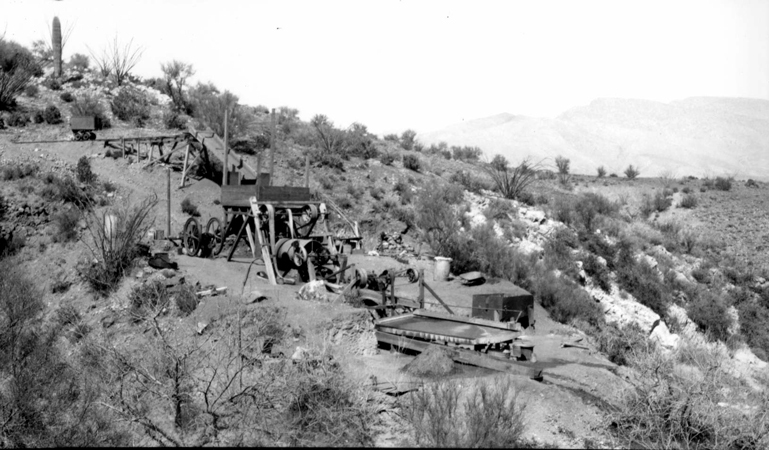 The Cowboy Mine is listed as a past producer of several metals including Gold, Lead, Silver, Zinc, Copper and Vanadium. By far, the greatest production was in gold. 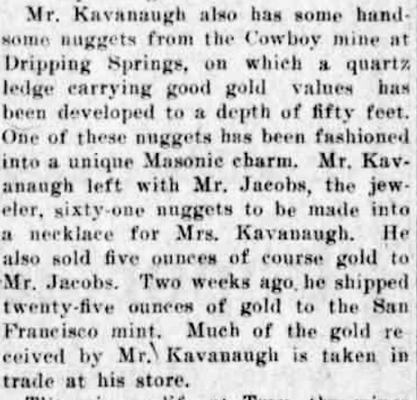 In 1908, this article appeared in the Arizona Silver Belt Newspaper. It appears that at least $25,000 in gold was produced in the years prior to 1920. There are also reports that several car loads of lead were shipped. A mill of small capacity has been built, a 50-ton breaker, a grinder, one concentrating table, 2 gas engines; Blacksmith shop, hammers and drills, picks and shovels, wheel barrows, all necessary tools for hand work. Two good camp houses, cooking utensils, beds, etc. to accommodate a small crew of men. Before this trip, I had never been to the Cowboy Mine or any of the country above it. Having grown up in Winkelman, I had been to the Vanadium Mine several times. I used the topo map/satellite view at http://mapper.acme.com/ to help plan the trip. I entered: Cowboy Mine Arizona in the "Find" field to bring up the correct map. The topo map shows a jeep trail to the Cowboy Mine. It comes up from the northwest out of the Dripping Springs Valley. Concerned that the ranch along that road may not allow access, I looked for an alternative. The satellite view seemed to show one. Not marked on the topo map, but visible in the aerial photograph was a road between the Cowboy Mine and the Vanadium Mine. 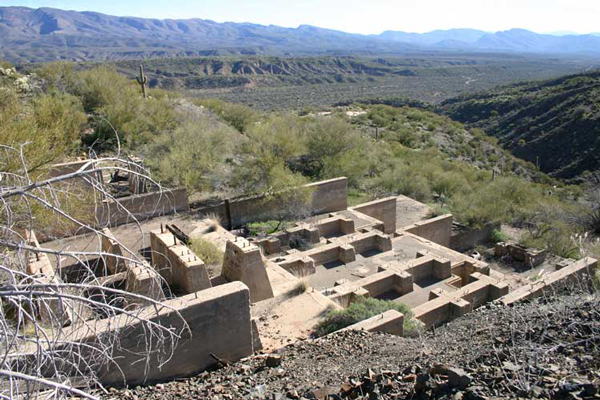 Although there is a ranch near the access road to the Vanadium Mine, I knew that there was a bypass around its private land and access to the mine was available. That was the direction that I chose to try. Leaving my truck at the edge of the valley below the Vanadium Mine I walked through the ruins of that old mine on to the Cowboy site. The Vanadium Mine can be accessed by stock 4wd vehicles. I think that the road becomes too "skinny" for full size vehicles beyond there. Before the trip, I had speculated that the road between the two mines may have been a modern "exploration" road. It was a surprise to find that the road was much older and more substantial than that. Why was the trail not marked on any of the topo maps that I had seen. There was an encounter with a native critter along this section of the road. 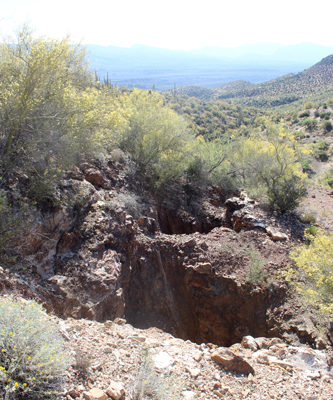 Approximately 3/4 of a mile above the Vanadium Mine, these two mine dumps appeared. They are below the area indicated on the maps as the Cowboy Mine. It took a few minutes to realize that this was the location of the Mill in the 1921 photograph. Not much remains of the old facility today. A large saguaro now stands over the site. Could this pipe line that is on the dump be one of those in the 1921 photo? Were these pieces of lumber and sheet metal remnants of the old mill? What kind of machine had once been mounted on this old wooden and concrete base? There was a great variety of screws, nails and other fasteners scattered around. These heavy iron wheels approximately 14" in diameter were the only pieces of old machinery that I saw. Just above the old mill site were these excavations. They are not accessible today. At the old mill level, an adit whose opening is now closed may have connected to these workings. On up the old road a 1/2 mile or so beyond the mill site was the area identified on the topo map as the Cowboy Mine. 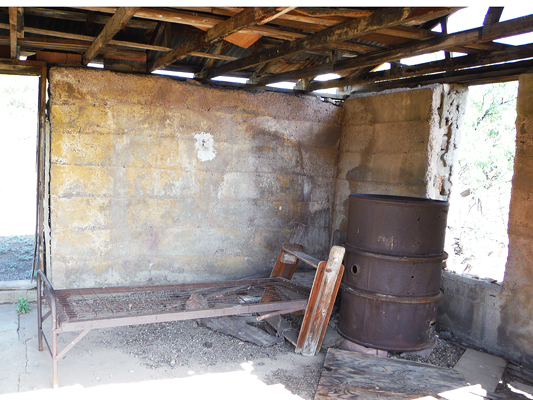 The dilapidated cabin shown in the top photo above is located here. The stone work in the two walls of this cabin is interesting in that it is a veneer over concrete. North of the old cabin are many pits and and shallow workings. I had read that one of the shafts had a timbered double compartment collar and wooden headframe. There were no remnants of those structures found. I also did not locate a tunnel that had once served as living quarters. It was interesting that the workings were pretty much in a line down toward the mill site below. Prior to going out on this trip, I "flew over" the area using Google Earth. Approximately 3/4 of a mile southwest of the Cowboy Mine, there appeared to be a piece of machinery parked alongside a road. I walked over that way after looking around at the mine. This was the machine in the satellite view. 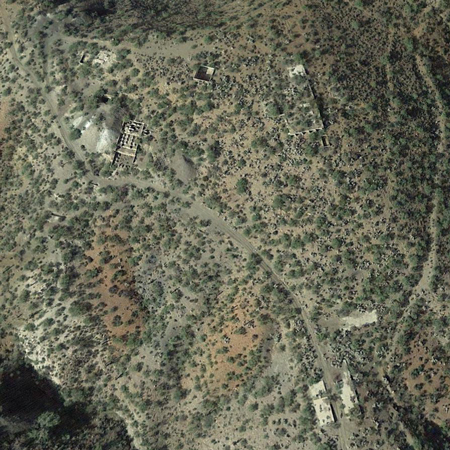 Google Earth images dating back to 2003 show the machine in the same location. Is this destined to be a future relic of 20th or 21st century activity in the area? On the trip back to my truck, I poked around a bit at the Vanadium Mine. Alternately known as the C & B Mine, the Cutler & Bywater Mine and the C & B Vanadium Mine, this mine was one of the first that I had ever been to dating back to my days as a kid growing up in nearby Winkelman. I have been back several times. In 2008, I posted on this site several photos of the mine. There is information available on its earliest days. This AZGS photo taken in 1920 of the mill is an example. 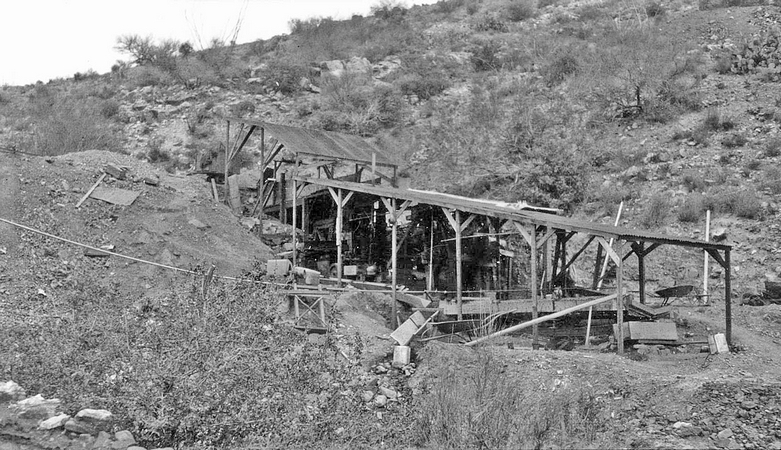 And there is this section of a 1920's era report from the AZGS that was posted online as part of the Arizona Memory Project that described the mill equipment set-up. Another source reported that in 1919 and 1920 the mine produced 500 tons of ore that concentrated down to 49 tons of Vanadinite of which 9.5% was Vanadium. A visit to the mine site today reveals that at some point in time there was much more to this mine's history than that reported in the 1920's. 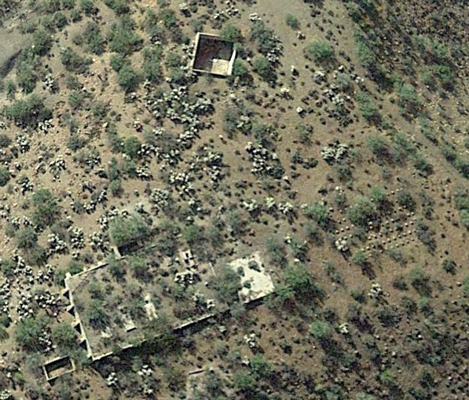 This Google Earth View of the site shows the extensive concrete foundations that are on the ground today. 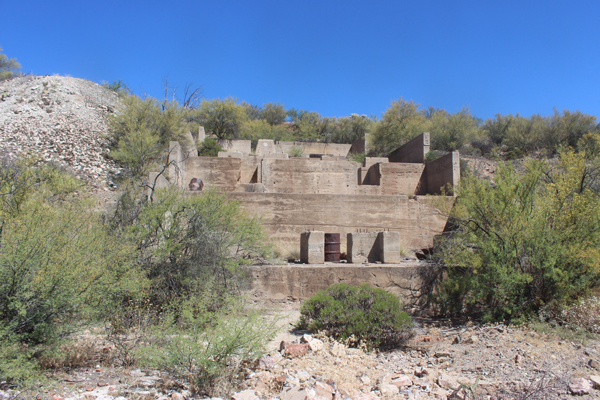 Included are the remains of a large mill that was much more sophisticated than the one in the photo above. 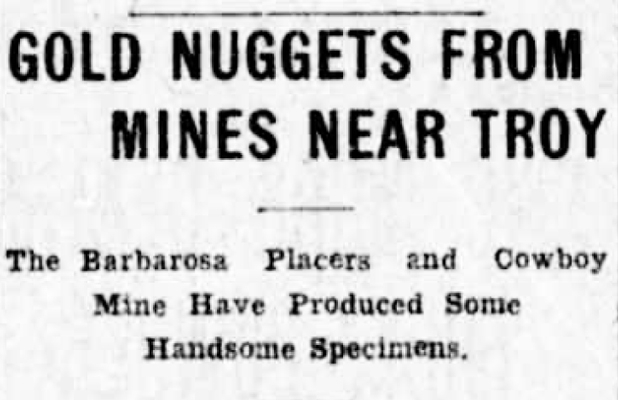 I have been unable to find any info on this later period in the mine's history. My parents can remember seeing the foundations in the 1940's. There is one basic report available from those years, but there is no mention of any production or what the physical set-up was about! It is curious that there seems to be so little information available about this stage of the mine's history. Could the foundations in the lower left corner below have once been for a power house? The concrete pedestals suggest engine/generator placements. These buttresses re-enforced the tall concrete footings. A large concrete water storage basin. The lumber used in the forming of the sidewalls was 12" wide. Based on that, the tank was at least 15' deep. This array of concrete piers is to the west of the power house foundations. We think that these foundations once supported the hoisting machinery for the nearby shaft. This pair of foundations enclose large floor spaces. What was the purpose of the buildings that once stood here? Across the canyon the dumps of three adits can be seen. Once back at my truck, I figured that I had walked approximately 6 miles round trip up through the Vanadium Mine to the Cowboy Mine and then on to the old Bulldozer on the ridgeline of the mountain range. The difference in elevation had been from 2600' at the start to 4000' up on the crest. It had been a good day out wandering around.